Applications for graduate school require examples of mastery of the knowledge. In today’s competitive pool, GPA is not enough. The extracurricular activities and demonstration of professional focus are needed to promote a student to a top selection spot in a graduate program. 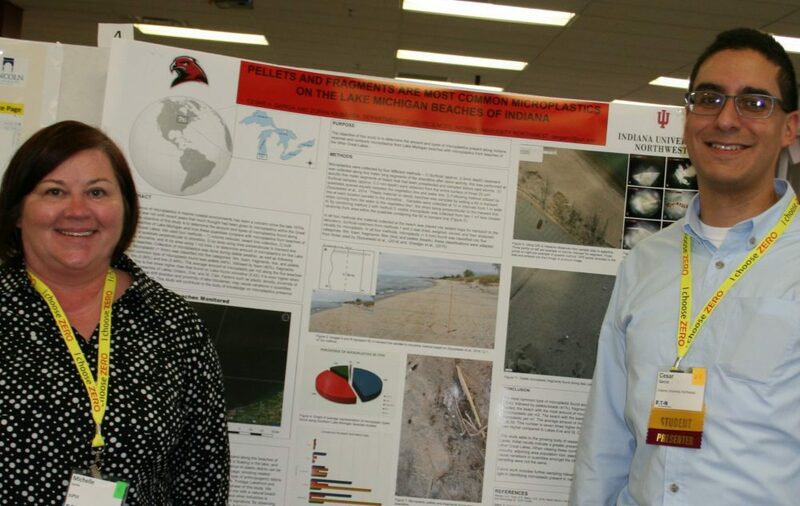 IN LSAMP uses travel funds to provide students the opportunity for professional development through presentation of their undergraduate research. Garcia has participated in research throughout his undergraduate career and his work has been accepted several times for presentation. What started as one research project has grown into a path to his future career. 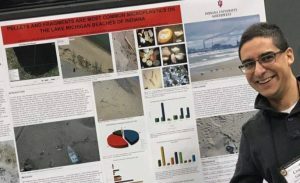 Garcia’s undergraduate research project focused on microplastics along the southern shores of Lake Michigan. His research experience is the catalyst to live out his advice. In fall, he has presented his work at three different events over a period of fewer than three weeks: IN LSAMP conference in Indianapolis, Eaton and LSMCE Technology Open House, and the Geological Society of America Annual Meeting. From abstract submission to travel arrangements, Garcia shares his unique insight. Reach beyond your comfort zone and submit for conferences with a broader audience. Tailor your message to your audience to receive valuable feedback. Anticipate the amount of time needed to present and travel with existing coursework. Each conference offered respective challenges which gave Garcia perspective and understanding; opportunity to speak from the stage to a room full of people, describe his project to scientists outside his profession, and network with experienced scientists thereby gaining valuable contacts. All valuable experiences for an aspiring university professor. Garcia offers this final advice to his fellow students, “All of these experiences have made me more marketable to graduate schools. They have also helped me grow as a person.” Academic endeavors involve planning, organization, reliance on faculty and hard work. Congratulations, Cesar Garcia for a job well done! Salvador collecting donated microscopes from the Medical Assisting Program for the Ivy Tech Engineering Society (IES). This philosophy is why IN LSAMP supports and invests in scholars along their STEM Career path. Mentoring is provided from the beginning of the journey to the finish line preparing students to reach goals today and dreams tomorrow. Salvador Valle Rodriguez, a pre-engineering student at Ivy Tech Community College, serves as an IN LSAMP Scholar. Through participation in the program, he discovered an opportunity to journey to Southern Illinois University to accomplish one of his goals of participating in undergraduate research. 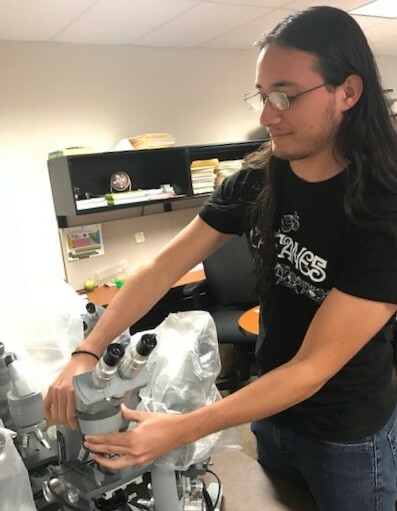 Research experiences for undergraduates (REU) supports active research participation by undergraduate students in areas funded by the National Science Foundation. This program supports students in ongoing research early in their education and is key to preparing students for the workforce. IN LSAMP builds on academic, social, and professional preparation so students feel confident participating in research outside of their home campus. 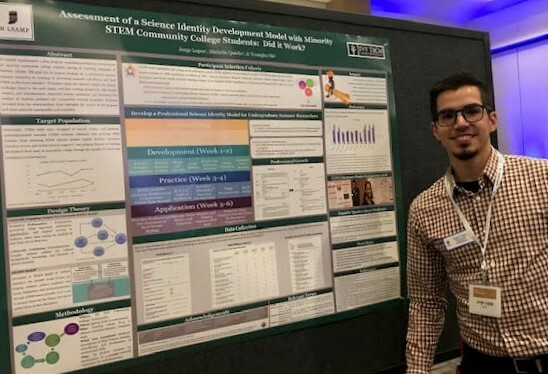 Jorge Lopez presented, Assessment of a Science Identity Development Model with Minority STEM Community College Students: Did it work? during the poster session at the Assessment Institute conference in Indianapolis in October, 2018. Jorge conducted the pilot study and collected data as part of his HESA internship for IN LSAMP. Jorge noted the highlight of the presentation was an opportunity to display his hard work and accomplishment but also observe the findings of other professionals. He received feedback from attendees who were interested in the results of his research project that focused on preparing community college students to work in research labs on a four-year campus. For Jorge, this opportunity enabled him to network with the representatives from institutions in Texas, Arizona, Missouri, and others. Overall, the greatest success was promoting the LSAMP program and attendees expressed an interest in bringing an LSAMP program to their own campus. Over 100 attendees from several universities and colleges across the Midwest joined IN LSAMP scholars to broaden participation in STEM degrees and careers. Students from six of the IN LSAMP campuses were part of the Undergraduate Research Showcase where they were able to share their experience in cutting-edge research labs and acknowledge the impact of their faculty mentors. Brian Thomas, from KIPnspire, motivated the students to network and build bridges for future career explorations during the STEM Career and Resource Fair. Today I learned that failure is not an option and that only YOU can make your dreams come true with hard work. Campus Director, Dr. Don Pappas, invited high school students from the McKenzie Center for Innovation and Technology. Dr. Rona Robinson-Hill, from Ball State University, shared feedback from high school students who attended the event. Thank you for giving us this opportunity to be in this special event and giving me and my peers with me a head start for my future. I learned that because not many like you are in that profession shouldn’t stop you from becoming the first. We look forward to seeing everyone next year at the LSMRCE Conference in Indianapolis Oct. 24-27, 2019.